Kylie Jenner was feeling a bit camera shy as she wrapped up a quick trip to Barney’s New York with her big sister Kendall, who, unlike her sister, went on her usually way with the paparazzi. Kylie covered her face with one hand as she exited one of the Jenners’ favorite stores with her purchases in her other hand. Big sister Kendall was just a few steps ahead of her, keeping her cool as she hid behind her oversized sunglasses. Kylie wore a surprisingly breezy outfit despite the lowering temperatures. The 16-year-old opted for a winter-friendly quilted green skirt from Topshop, which she paired with black cropped top. The reality television star went with bare legs, decorative socks, low-cut leather boots and the gorgeous Givenchy Mini Pepe Pandora Messenger bag in black to finish her look. The cold will still be hanging around for at least a couple more months, so if you’re tired of the usual black leather skirt, choosing a quilted, zippered one might just be the revamp you need. The only thing that we’re iffy about with this adorable piece by Topshop is that it is made out of PVC. 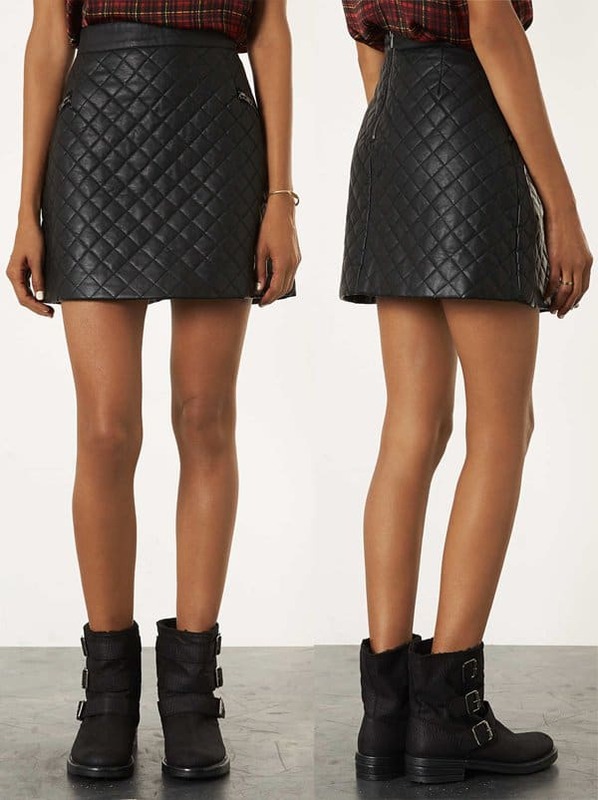 Some 100% genuine leather would have ensured that this staple skirt would last you at least a couple more winters. The skirt is no longer available in green but you can get its black counterpart at Topshop.